After reading the original article by Audrey Watters about a year ago, I read this one with great interest as I was chasing the idea of setting up our own Minecraft server. It was interesting to read about the details, now if I can just get to affording it. It’s been almost a year since I first wrote about the work of Joel Levin (aka "The Minecraft Teacher") bringing the 3D world-building game Minecraft into his second-grade classroom. Much has changed since then — the full release of the PC version of the game, for starters. Mojang co-founder "Notch" stepping down as the lead developer of Minecraft (that is sort of "inside baseball" information, I suppose). And Levin himself co-founding a startup — TeacherGaming — the only company sanctioned by Mojang as an official reseller of the game. Levin’s still teaching too, but he’s also hard at work helping other educators implement Minecraft in their own classes. Currently, that takes the form of MinecraftEDU, TeacherGaming’s first endeavor. 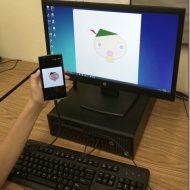 It’s both a product and a service, tapping into the expertise that Levin has accumulated while using Minecraft in his classes and by supporting the teachers that have been drawn to doing just the same. MinecraftEDU offers educational licenses to the game at a deep discount (up to 50% off the regular price). There’s also special training for educators who are interested in using Minecraft with their students. Additionally (and perhaps most importantly), the startup offers a special version of the game — slightly different than what’s sold to regular customers (more on that below). With or without special mods, there are a lot of reasons why Minecraft is a wonderful game for the classroom: it is open-ended (there are no explicit missions — no princesses to save or wagon trains to get to Oregon); it’s deceptively simple in its graphics yet complex in what people have actually built (See this Quora thread for a short list of some of the coolest things); the game can be played in single person or multiplayer mode and can run on both public and private servers; and the Minecraft community has developed tons of modifications to extend and alter the game’s functionality. 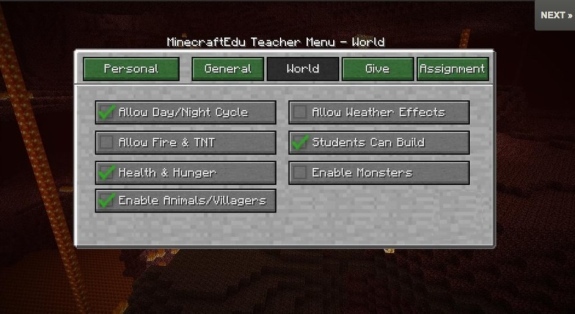 MinecraftEDU provides one such "mod" that’s been designed for classroom use. 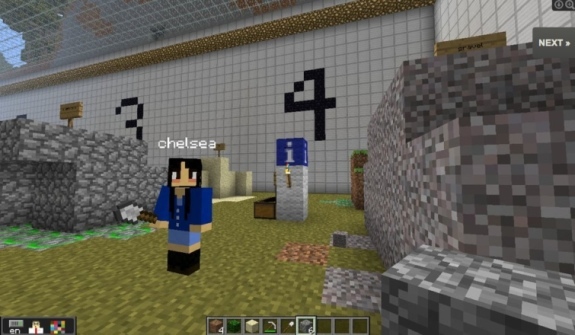 At the very outset, the mod tackles one of the biggest barriers to implementing Minecraft at school — that is, setting up your own private Minecraft server. The MinecraftEDU mod allows teachers to do this with just a few clicks, turning their own PCs (Mac, Windows or Linux) into a local server. The mod comes with a lot of other options too, allowing you to maintain the open-endedness of the original Minecraft or alter it substantially. With the mod, students are able to name their characters, and they can change gender and costumes. There are special blocks for the game too: information blocks that students can click on to get, well, information or instructions; blocks that will teleport students to a particular spot in the world; blocks that can be set in the ground to allow or disallow building on top; and border blocks so that students can be kept in one particular area. It’s easier to control the students’ characters — teleporting them en masse to the teacher, or teleporting the teacher quickly to a student, for example, or freezing everyone’s characters in place. Inventory is more easily manageable, making it possible to put a particular item in everyone’s inventory. The MinecraftEDU mod also comes with some building tools to make building a world easier for the teacher should they decide to pre-build particular structures for their classes. And, of course, you can turn off the spawning those awful zombies, skeletons, spiders, and Creepers. At the recent DML conference where Levin spoke on a gaming panel, there were a lot of questions about these sorts of alterations to the gameplay. Do "more controls" in Minecraft actually destroy the beauty of what’s otherwise a very exploratory, open game? Levin has responded with a blog post on structured versus unstructured play in Minecraft — a post that gives a good glimpse into the experimentation and thought processes that Levin himself uses in teaching with the game. Noting that he falls somewhere in the middle of the structured versus unstructured argument, he writes, "We are all in uncharted territory here. Never before have teachers had a game with the breadth of experiences and malleability that Minecraft offers." MinecraftEDU needn’t hamper that malleability, I’d contend, particularly as most of the controls are toggle-able (and you can always play the game without the mod). 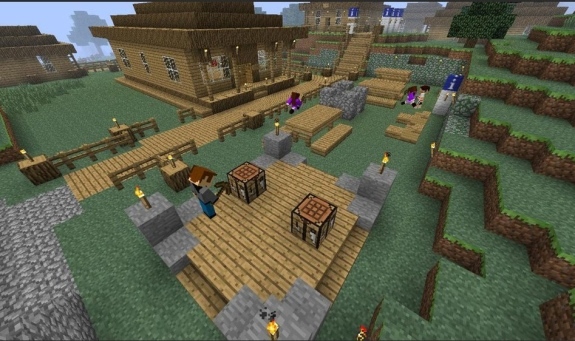 Rather, MinecraftEDU helps alleviate some of the technical burdens of bringing the game into the classroom and adding features that, based on Levin’s and other educators’ experiences, are much in demand for Minecraft-based learning and exploration. There are more features in the works for MinecraftEDU too, including making it possible for world-builders to contribute to files to the platform so that classrooms can take virtual field trips into some of the incredibly rich worlds that Minecrafters have crafted.